116th day of the year. There are then 249 days left in 2019. 38th day of Spring. There are 57 days left till Summer. 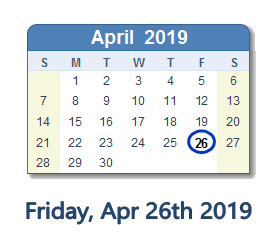 April 26, 2019 is the 7th day of Passover (Jewish Observance). What happened on April 26th 2019?